A virtual Historical Society for Springfield, MA. We will present stories about Springfield's history, advocate for historical preservation, and provide a place for users to contribute their own knowledge of Springfield's past. When I saw this unique stereoview for sale, I just had to buy it. It depicts the downtown Springfield block that used to house the Massachusetts Mutual Life Insurance Company. 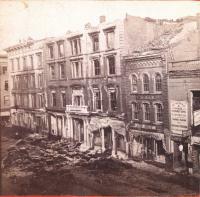 It isn't your typical stereoview because it shows this block right after it suffered a devastating fire. What happened to the Magnolia Terrace lions? I have come across many different photographs and drawings of two bronze lions that once graced the pedestals in front of Magnolia Terrace in the Forest Park Heights historic district. This blog has been a little quiet lately -- it actually takes more time than I expected to assemble a coherent article on Springfield's history. Plus, I'm a procrastinator. I've recently been focusing on stereoviews, which were produced between 1850 and 1900, but were most popular in the 1870's. They are among the earliest photographic records of Springfield. This was an exciting time in the city's history. Springfield nearly doubled in population from 1860 (11,766) to 1870 (26,703). Change was rapid - and it's always more fun to be expanding than contracting or stagnating. A while back I picked up a couple of photos of Forest Park. 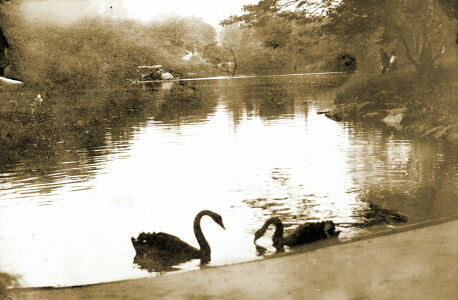 They were fairly nondescript - one was a picture of a couple of swans in a pond. But then I looked a little more closely, and was pleasantly surprised. Who were Griswold & Steele? If you collect real-photo postcards of Springfield, the line "Griswold & Steele, 37 John St., Springfield, Mass." should be very familiar to you. Of the dozens of photo postcards I've seen of our city, over 75% were produced by this company. I have over 65 different cards of theirs, and I know of at least that many more in the hands of other collectors. But just who were Griswold & Steele? It's hard to know for sure, but I dug up some basic information on this prodigious duo. In order to get my daughter interested in history I try to make the past mysterious and exciting for her. 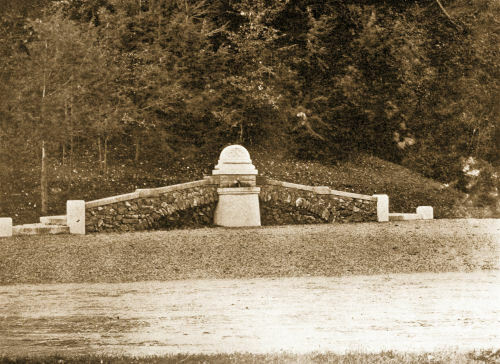 One of my favorite teasers is about the "Lost Fountain of Forest Park".